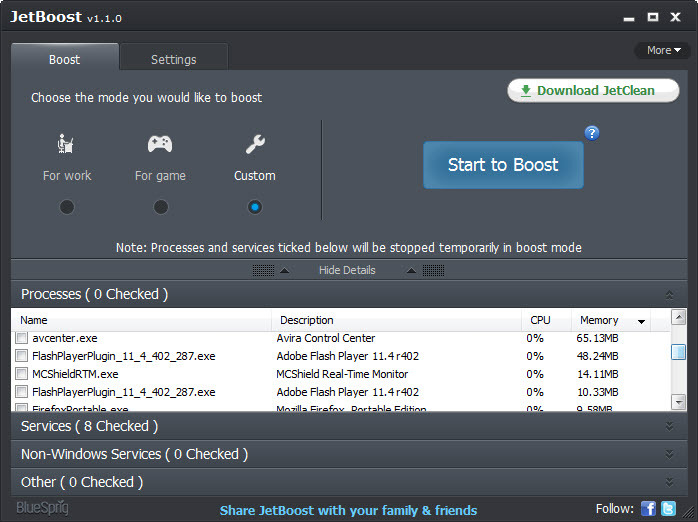 JetBoost ensures top performance from your PC. It releases system resources by shutting down unnecessary background processes and services and prioritizing processes. With three boost modes – game, work and custom – JetBoost configures your PC to best meet the demands of your activities. Game mode provides super gaming experience by automatically detecting and shutting unnecessary processes/services. Similarly, work mode is pre-configured to best meet your requirement for work. And custom mode allows you to create your favorite boosting mode! You can even turn on those stopped processes after your work is done, with a click of a mouse!! 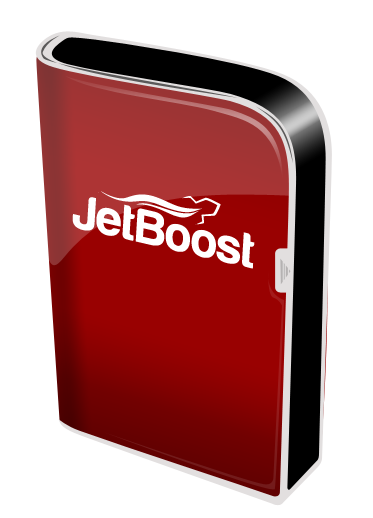 JetBoost can be downloaded from their official mirror at MajorGeeks or from their webpage. The downloaded installer (jetboost-setup.exe ; 2.89 Mb) digitally signed with BlueSprig, Inc. Installation is fast and clean. Desktop icon is created by default and the software is launched at installation end. Microsoft Windows 8 (Developer Preview), Windows 7, Vista, XP and 2000. Including both 32-bit and 64-bit versions. Launching the software requires administrative rights. You will be greeted with a nice and customizable interface with easy to follow instructions. 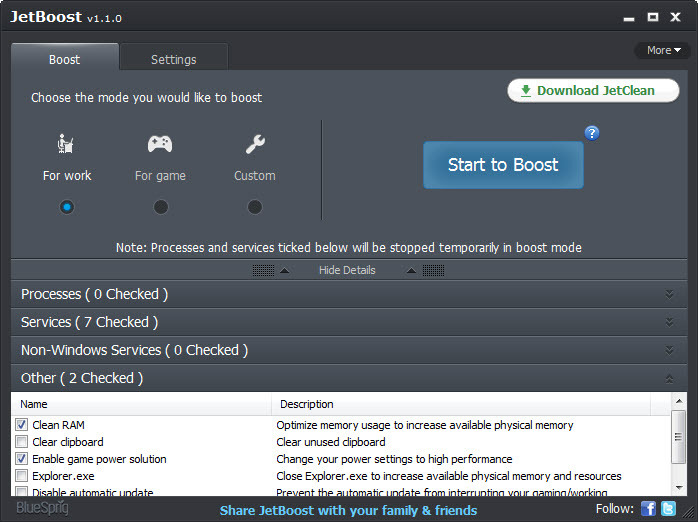 As already mentioned, JetBoost uses three boost modes – game, work and custom. For Work or Game mode, the application will shut down unnecessary processes such as taskmgr.exe, Speccy.exe, steam.exe, utorrent.exe, bitcomet.exe, googleearth.exe, etc. as well as services such as Help, Task Scheduler, Application Updater and more. Users can always click Hide Details to see all stopped processes, services and other optimized items. Additionally, in Custom mode, users can decide which processes, services and other items listed in JetBoost to close and optimize. Boosting at a selected mode starts just by clicking on the Start to Boost button. It will then boost and show you the result. You can go back to restore the stopped processes and service by just clicking on Restore button. 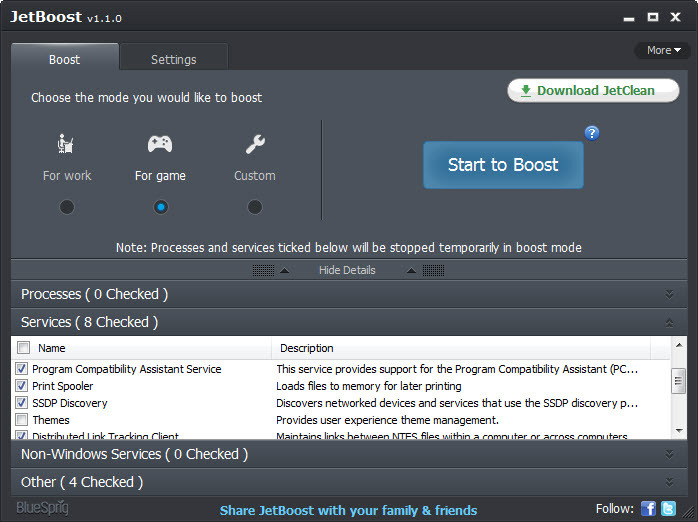 JetBoost sits on system tray after it is launched and can be launched anytime by clicking on it or by using the hotkey combination Ctrl + Alt + B. It can also be launched at system startup. It makes a list of services, Windows and non-Windows that can be safely turned off. You can edit the list o remove and add custom entries. The software is avilable in 17 languages: English, Bulgarian, Catalan, ChineseSimp, ChineseTrad, Estonian, Dutch, German, Japanese, Turkishlified, French, Italian, Hungarian, Polish, Portuguese, Russian, Spanish. Translation to any other language can be made too. A Portable version can be made via the menu. 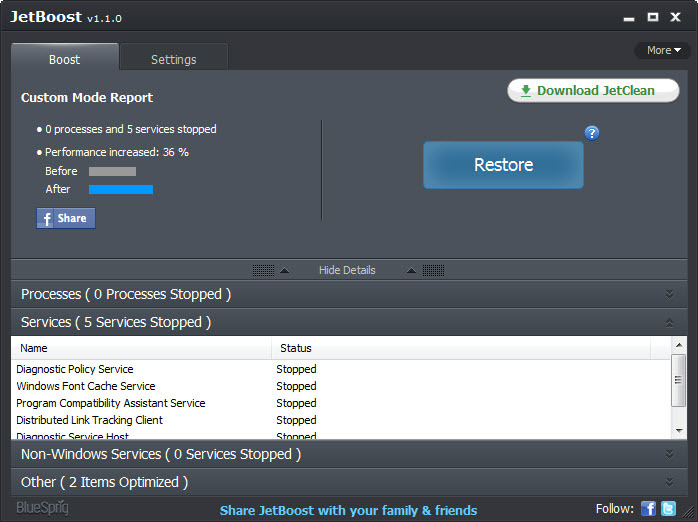 JetBoost cancheck for software updates automatically or manually, even under proxy with authentication. It uses two processes while the interface is open requiring little system resource. Shuts down all unnecessary processes and services to fit your needs with one single click. Get the maximum capacity out of your PC and focus on gaming only. Remove distractions from irrelevant applications when you’re working. All unnecessary processes and services had been shut down. Set up your own boost model by choosing which applications you would like to shut down temporarily. Free from any malware, spyware, and virus. Checked against various anti-virus programs and proved to be absolutely safe. Download and use the tool completely free. My experience with the software was pretty good and better than any similar software. It offers seemless customization and safety but still make sure what you are doing. The software is recommended. This entry was posted in Free, OS Enhancement, OS Maintenance, Portable, Software, Windows.